Since I still have some leftover buttermilk from the blueberry crumble cake that I shared in my previous post, I didn’t hesitate to make this quick and easy buttermilk brownies. 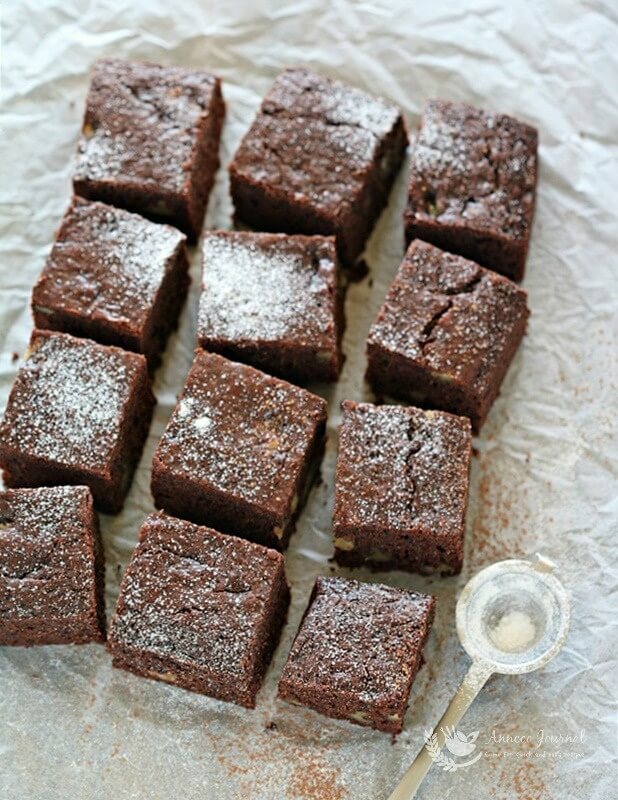 These buttermilk brownies are light, tender and soft and look pretty with a dust of icing sugar. You may frost with ganache cream for a richer chocolately texture. 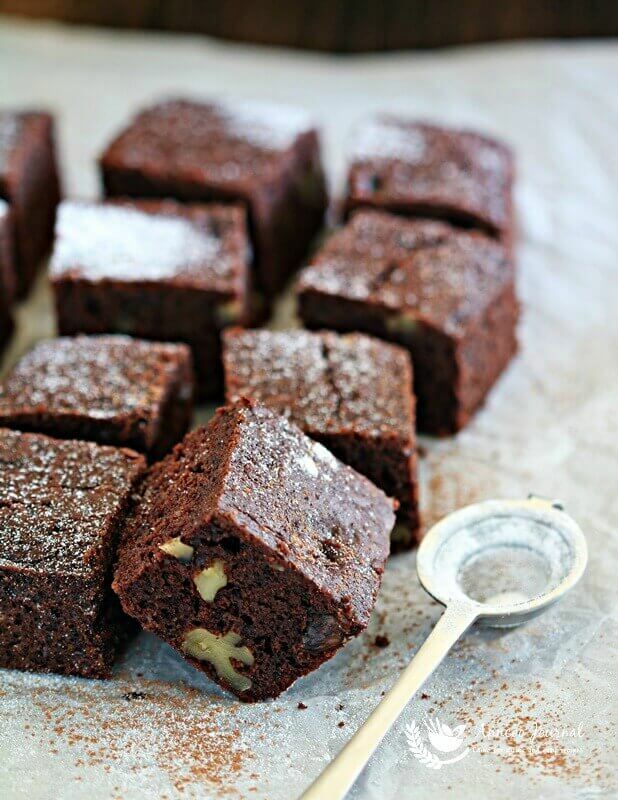 Great to serve these brownies warm or with a dollop of vanilla ice cream. Preheat oven at 160 deg C. Line a 20cm cake pan with baking paper. Sift flour, cocoa powder and baking soda ogether in a bowl. Add in sugar and mix well. Warm butter at low heat till melted and stir in instant coffee powder. Lightly whisk eggs, butermilk and vanilla extract together in a cup. Then pour into the flours together with melted butter. Gently fold well with a rubber spatula followed by the chocolate chips and chopped walnuts. Pour chocolate mixture into prepared pan and bake for about 25-30 mins until cooked when tested with a skewer. Cool in pan on a wire rack about 10 minutes, before lifting out onto rack to cool. Cut brownies into 16 pieces and dust with some cocoa powder and icing sugar over it. 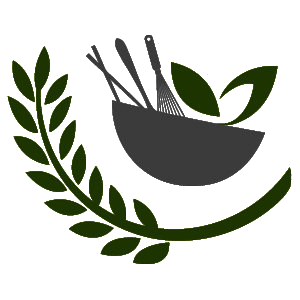 Serve immediately or store in an airtight container. Never knew buttermilk in Chinese is called 白脱牛奶, learned something new today! 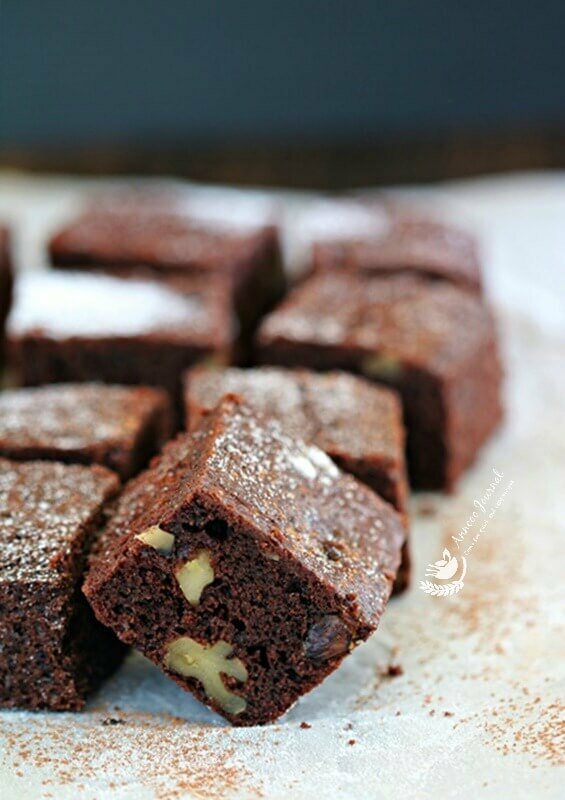 This buttermilk brownies is just perfect with a cup of tea! They look sensational! What kind of cocoa powder did you use? Not dutch-processed, I guess? Hi Angie, I used Hershey’s cocoa powder. wow that looks yumm, have a nice week end Ann.